You may have noticed there's a current trend in home design right now that has many reaching for their paint brush, the all-white interior. Timeless and simple, white can be the perfect choice to make a room feel bright and fresh. 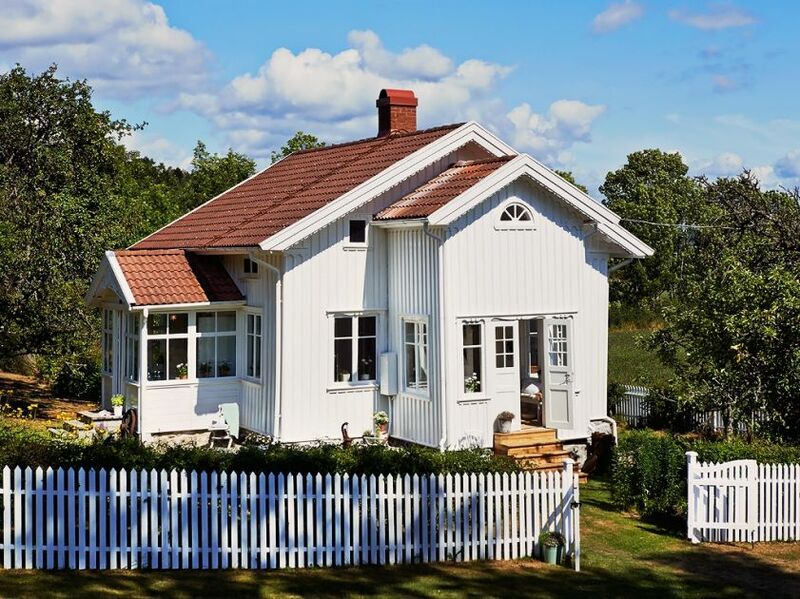 If you're ready to try the trend yourself, take a cue from this Swedish cottage tour. The home featured below feels warm and inviting despite the all-white rooms. It's important to add organic and natural materials, as shown here, to avoid the space feeling sterile and uninviting. 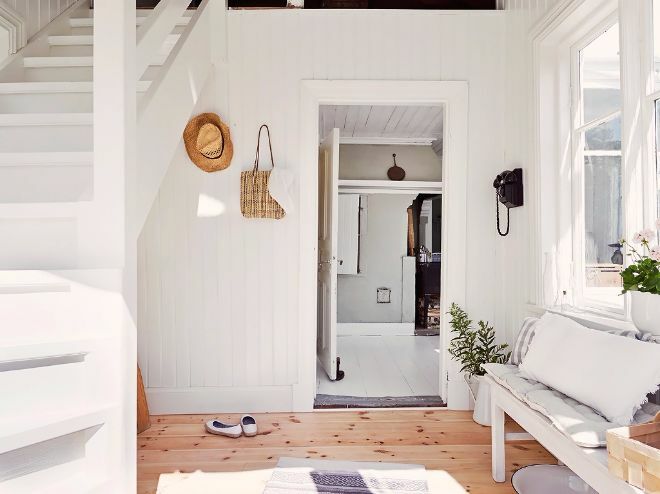 Check out the full tour below and you'll be dreaming of your own white cottage with a white picket fence, white walls, and yep - white furnishings! 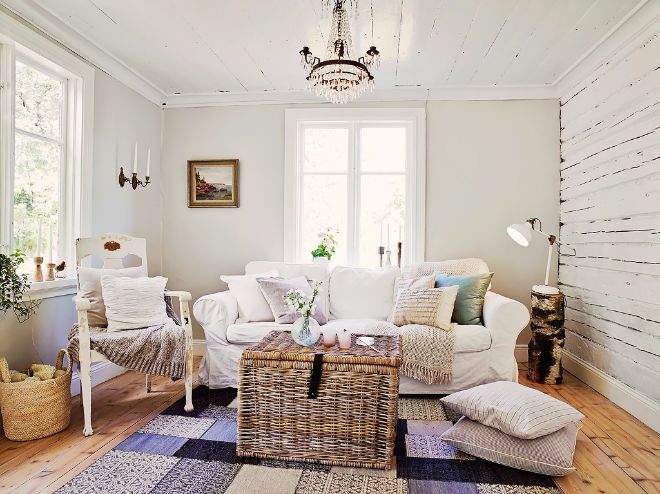 The warm hardwood floors contrast nicely to the white walls and add warmth and interest. 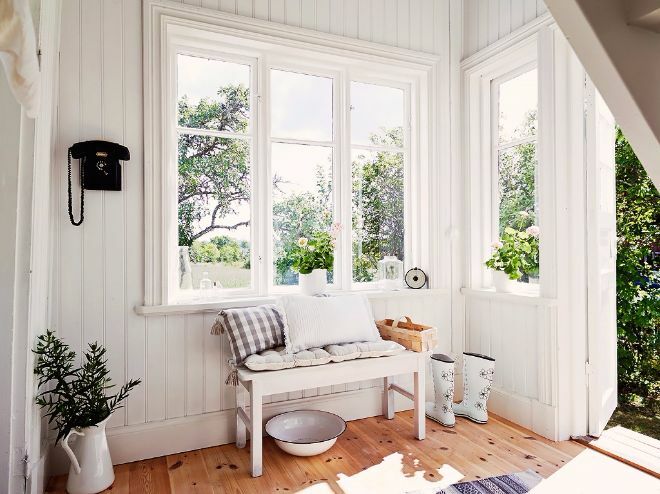 Plenty of windows brighten the space and help keep the white paint from feeling dull and lackluster. The foyer area is the perfect place for bag and hat storage, a couple of wall hooks will do the trick when square footage is limited. Plant life always adds an element of life and freshness to a space. The living room is sweet and charming. Natural elements such as the log table and woven baskets add coziness to the room. 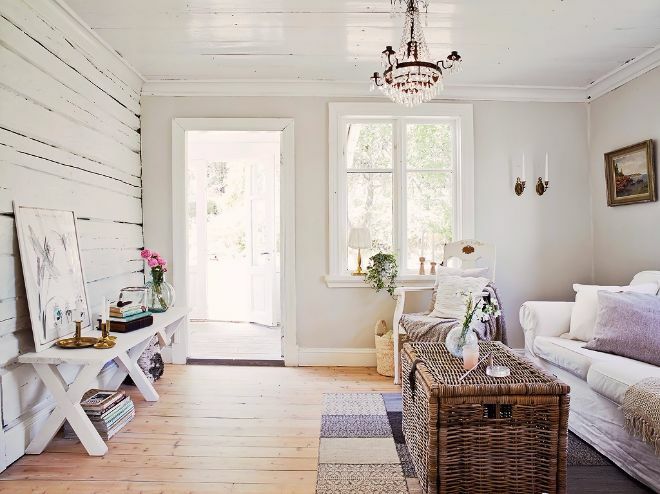 The wood planked wall adds interest and is painted white for cohesiveness with the rest of the room. An antique chandelier is the perfect finishing touch. 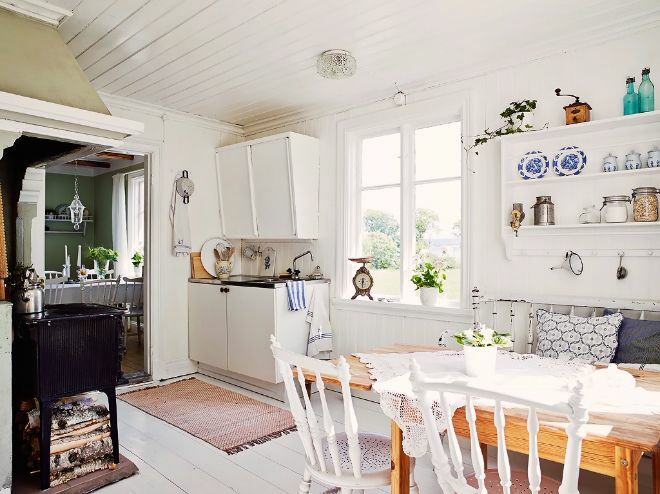 The small kitchen features an antique stove, planked ceiling, white cabinetry, and an eat-in dining area. A throw rug warms up the white floors. 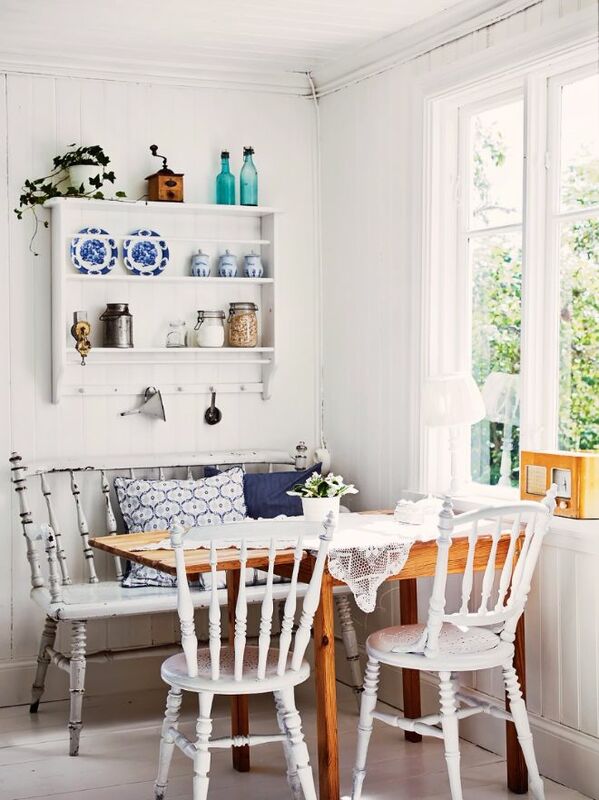 The dining area has an eclectic vibe with its mismatched dining furniture and antique accessories. Blue pillows as well as the matching blue china displayed on the open shelf, are lovely accents to the space. 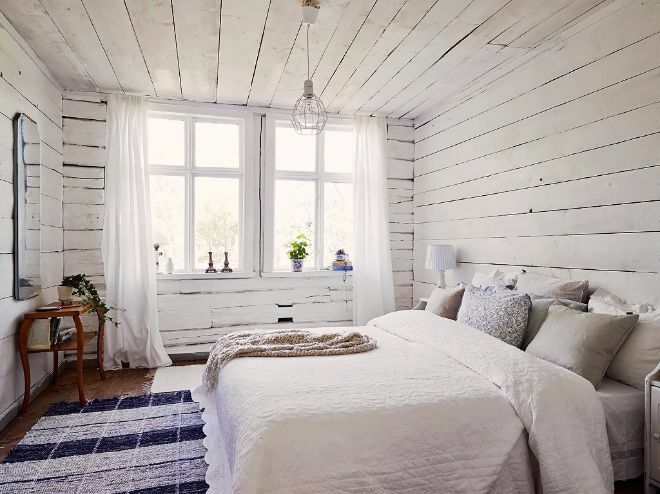 The bedroom is rustic and inviting with its painted wood planked walls. White flowing draperies and white bedding soften the space. Blue accents are also carried into this room with a blue rug and a blue throw pillow.